The Java scalb Function is one of the Java Math Library function which is used to return x * 2ScaleFactor rounded as if performed by a single correctly rounded floating-point multiply to a member of the double value set. In this article we will show you, How to use Math.scalb function in Java Programming language with example. number: Please specify the double value or specify any expression here. ScaleFactor: Please specify the Scale Factor value here. If the first argument is infinite, Math.scalb will return the result as Infinity of same sign. If the first argument is positive or negative zero, Math.scalb will return the result as Zero of same sign. and, if the first argument is not a Number, Java Math.scalb will return the result as NaN. First, We declared variables of type Double and Float to display the functionality of java Math.scalb function on different data types. 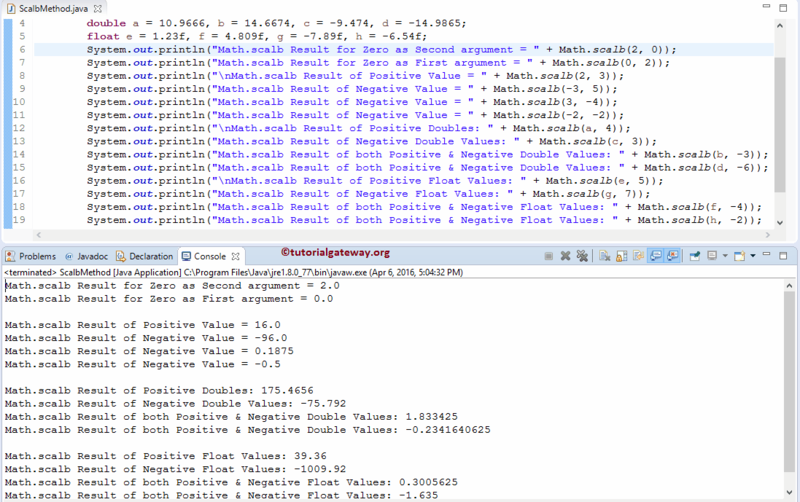 Next, We used the Java Math.scalb Function directly on both the Positive and negative values. Next, We used the Java Math.scalb Function on variable a, b, c and d (they belongs to double type). Following statements will call the scalb method of double type ( static double scalb(double number, int ScaleFactor) ) to display the result. Here, We used the Math.scalb Function on variable e, f, g and h (they belongs to float type). Following statements will call the scalb method of float type ( static float scalb(float number, int ScaleFactor) ) to display the result.